Jim Henson’s Dinosaur Train is a great show for pre-schoolers that ‘celebrates the fascination that preschoolers have with both dinosaurs and trains, while encouraging basic scientific thinking skills as the audience learns about life science, natural history and paleontology’. Introduced in August, Dinosaur Train’s InterAction collection is one of the coolest concepts we have tested for pre-schoolers. Each of the characters features ‘Smart Talk’ Technology which allows them to speak to each other. On top of making their own noises and sound effects Morris, Buddy, Tiny, Tank, Ned and Boris will chat, sing and share information about their specie if put in proximity of each other. For our test we received Buddy, Tank and Boris. While all 3 have their own special features they all stomp if you walk them on a floor or table, chomp if you put your finger in their mouth and have poseable heads, legs, arms, and tail. My boys love the show, but they love these dinosaurs more. Having them sing together is a big hit as is hearing them roar. 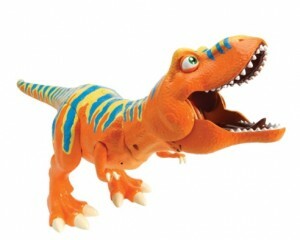 Their interactability and personalities make them more than a toy, they are like a friend. Thank you to Learning Curve for providing us with the samples for this review. Tank and Boris were kept in their boxes during our test and then donated to a local church Toy Drive for Christmas.